Happy Birthday to Loken (and me)! Last Friday Loken was three and I was fifty plus Loken’s age. We both had lovely birthdays, though I think Loken’s days are all pretty fine. Loken got some fine presents, a new bone (from Kevin), a new toy (from Kevin’s class), and a new Public Display of Affection from the whole family. Can you spot it in this picture? As a bonus, I only had to wait 20 minutes at the Los Gatos DMV office to pick up the new plates. Without an appointment. Loken is learning the “go to Kevin” command. On Saturday, he did it impromptu, no big setup or chance to smell the treats. Kevin told him “Loken, here”, so I slipped Kevin a couple of dog treats and gave the command. Loken was there at light speed, a big difference from the casual (but obedient) pace we are used to. Loken continues to be Kevin’s best friend and the best dog in the world. Just ask Kevin. 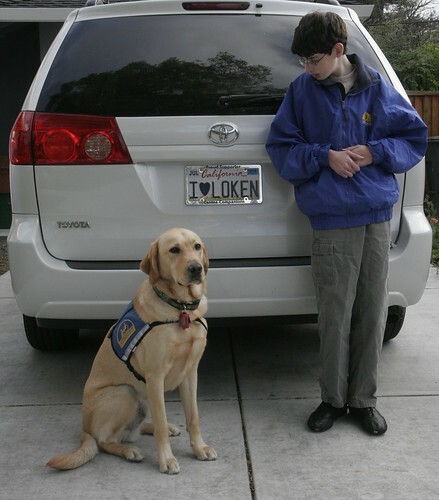 This entry was posted in Service Dogs and tagged Canine Companions for Independence, CCI, Loken. Bookmark the permalink.